Imagine you’re managing a team of sales reps attending one of the largest conferences in the world. Now imagine that you can stay back at the office and see the meetings that each sales rep has scheduled, where the meetings are located, and you won’t have to chase down your team members to update everything post-event. Sounds like a fantasy, doesn’t it? We all know that the reality of attending conferences and trade shows and managing meetings at them means spreadsheets on spreadsheets on spreadsheets. You need your spreadsheets so you have some semblance of organization heading into events and can say with a small bit of certainty how many meetings your team has scheduled, when and where they are, a column for notes for post-event follow up, a list of who you know you’ll need to chase down to fill in their notes, etc. Sound familiar? There’s no transparency among team members. Team members have to rely on their meeting manager to tell them what locations are available and at what times, leading to many questions that could be answered elsewhere. Version control. If you’re using spreadsheets, you risk team members not having the most up-to-date version or creating their own version to make notes on and ignoring the updated version. Google Sheets helps alleviate some version control issues, but accidental erasures and changes can be more prevalent. Things get missed. No matter how thoughtful and thorough we are, we are only human, and humans are prone to errors. Because of the manual nature of spreadsheets, prospects and meetings are certain to be accidentally overlooked, meaning your team is missing out on crucial meetings. Now let’s go back to that fantasy at the beginning of this post, the one where everything is organized for you. What if we told you that can become your reality? How, you ask? Through a new technology that simplifies the conferences and trade show experience called meeting automation. Meeting automation platforms (MAPs) automate the tasks and activities for which you typically rely on spreadsheets. Below we’ve outlined five reasons why you should stop using spreadsheets to manage your meetings and jump into the world of meeting automation. That’s right, from ONE place. With meeting automation platforms, you can have your prospects, events attended/attending, calendar invites, ROI analysis, and more at your fingertips. And because everything is logged automatically and syncs with your CRM, the reliance on others to input their data entry becomes virtually non-existent. SummitSync users reported saving 5–15 working days of time per team member across multiple departments. DAYS. Benefits: Saves time; Syncs with CRM; Everything is in one place. With meeting automation, team transparency becomes reality. Sales reps are able to see if there are conflicts in scheduling at pre-set locations and what locations they’ve been granted access to. No more last minute scrambling and rescheduling to secure the VIP space for your VIP prospect—with meeting automation, everyone is where they are supposed to be. Also, as the manager of your teams, you’ll be able to see how many meetings each prospect has scheduled and the number of prospects assigned to each sales rep. With this information, you will be able to make budget-saving decisions. For example, if Jim Halpert has scheduled 17 meetings at PaperCon and Dwight Schrute has only scheduled 2, you can decide to assign Dwight’s two meetings to Jim, thus saving your department thousands of dollars. Benefits: Helps with budgeting; Teams are on the same page. Benefits: Fewer errors; Reliance on manual data entry is eliminated. Let’s be honest: going back and forth between calendar invites and spreadsheets to update changes in time, locations, attendees, etc., is annoying. When you use a meeting automation platform, you eliminate the middleman. Any changes you make to calendar invites are automatically updated in your event notes. Over $570 billion is spent each year on attending conferences and trade shows, and yet, most companies don’t have a system in place to account for if their efforts are successful and turning into deals. And if you’re lucky, you’ll be the person assigned with tracking down receipts, meeting notes, whether meetings took place, making sure the CRM and that darn spreadsheet are updated. With meeting automation, you don’t have to do ANY of that. 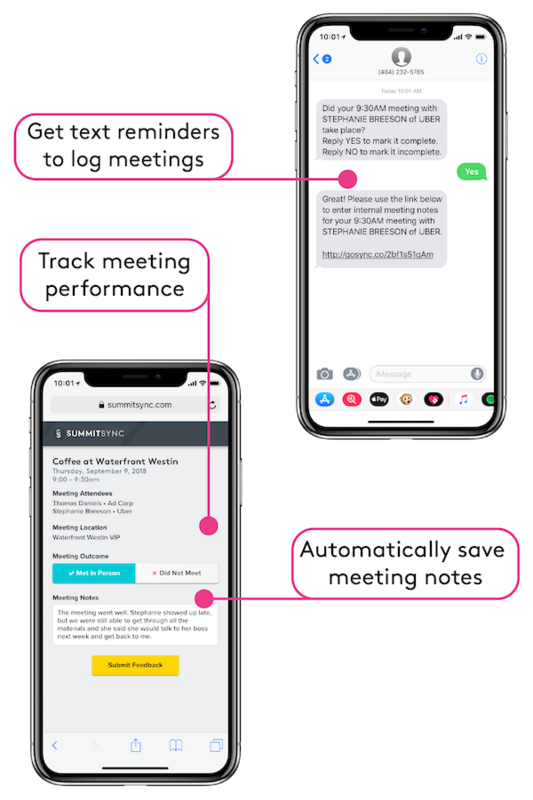 SummitSync recently rolled out a new feature called Notes-to-Go that sends a text to your sales reps to ask them to confirm if the meeting took place, along with a direct link to enter meeting notes. By tracking meeting occurrences and notes, you’ll be able to attribute ROI to events where your team had a presence and the source of opportunities, and then track year-over-year performance to inform your decision-making process on what events to attend the following year. In short, meeting automation can bring your team to the 21st-century. As B2B marketers, our goal is to sell, sell, sell, and meeting automation has been shown to shorten sales cycles and move prospects through the funnel faster. Do your spreadsheets do that?